Now a lot of people fertilize their lawns. Why? They want their lawns to look their best, grow strong, and live longer, right? Have you ever considered fertilizing your… trees? Just like anything in your yard that’s alive, trees need water to live– obviously. 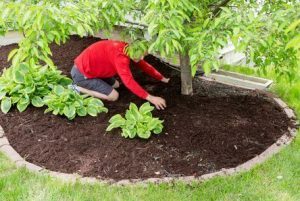 In the springtime, it’s a good idea to add some mulch around the base of trees. And then, to boost your tree’s intake of nutrients, it’s a smart idea to add fertilizer, too. You see, oftentimes modern soil is lacking in nutrients and minerals. That’s exactly why fertilizer comes in handy, to help give the tree what it might otherwise be lacking. Think of it this way: a tree growing in the forest is in an environment that’s a lot different than a yard. Forests are very natural– often untouched by humans, such that nature allows leaves, twigs and bark to fall to the ground, decompose, and, essentially, feed trees with good stuff. But what do we do in our yards? We dispose of leaves, twigs and bark. We “clean it up” to the point where nature is interfered with, and then we wonder why our trees seem unhealthy. What are some signs your trees are unhealthy? Do they seem to have shorter than normal annual twig growth? Are there undersized leaves, fewer in number than you’d expect to see? Do you notice dead branches and branch tips? Look at your leaf veins and check to see if they’re darker than leaf margins. Meanwhile, are leaves any other color than dark green? If so, your tree might be unhealthy… in need of fertilizer. Is there a best time to fertilize? Springtime’s a good time, though trees can, conceivably, be fertilized at any time of the year. Look for a fertilizer that offers a “slow, controlled release” with “low burn potential.” Those are the keywords to look for when in the store doing your shopping. If you feel like you’d rather have a professional come take a look at your trees and determine if/when they need fertilizer (and what kind), don’t hesitate to contact Forest Tree Service of Kingwood, TX, at 281-359-7874.